The banner of Grandma got STEM features a picture of Marie Sklodowska-Curie (7 November 1867 – 4 July 1934). The picture is from her biography on the official website of the Nobel Prize. When I first created the banner, I didn’t really know grandmothers in STEM. I had to hunt the interwebs to find a few images. My first call for submissions went out on Valentine’s day 2013; the blog, banner and first post appeared three days later when I realized I needed a place to collect and disseminate the information people had sent. Today, two months later, I am so grateful to the many people who have gleefully shared their personal pictures and stories. Every email, Facebook, Twitter, article, radio story and blog post love note to Grandma got STEM helps spread the word. The response to Marie Curie is interesting. Some people think she is overly used to represent all of women in science. And indeed, most people’s work in STEM will never garner such attention. I hope that this project will help celebrate all kinds of contributions, and that as a collection the work, pictures and stories will inspire us all. If you have a story to tell, and you are afraid “it doesn’t count,” please send it anyway. Without submissions, the project cannot grow. I have to admit that Marie Curie was never much of a role model for me (see this and this discussion of whether I should use words like “role model” in talking about women in science), because she seemed so extraordinary and I always felt so ordinary. Most inspiring for me have been regular people who are not afraid to let you see the sweat that has led to their success. Grandma got STEM honors and celebrates that sweat. 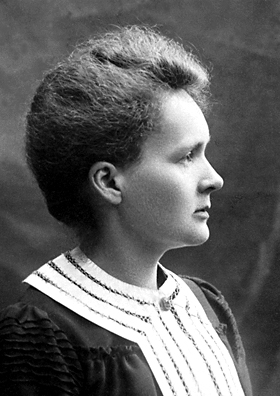 I won’t rehash already published stories regarding Marie Curie. You can find them out and about. Grandma got STEM is about personal connections, stories and remembrances. For me, Curie’s picture in the banner reminds me that in two months I have gone from scraping the web and begging personal contacts for a few grannies, to reaching readers in 116 countries with the stories of 70 phenomenal women. This entry was posted in From the blogger. Bookmark the permalink. I don’t remember how I found your blog, but I have really enjoyed reading about all these awesome STEM grandmas…my grandmas were not very STEM, so I cannot add to the stories, specifically. I have some STEM “moms” and I may need to send you some info about them some day…Thank you for doing this for us : ) Peace.